The organised portion of our trip to Turkey concluded late on Friday night with a group meal in Roof Mezze 360, an upmarket restaurant with panoramic views of Istanbul. Saturday morning thus began with the group dispersing in four different ways. Some headed to the airport for an early flight, some slept off the excesses of the night before, some set out to sightsee, and the usual suspects set out on tightly packed credit whoring expeditions. Volker, Bruno, Anita, Megan, and I hired a rental car and called in at nine parks over eleven hours. The branch of Starpark in the ArenaPark Mall had closed a few months earlier and the rides at Safari Park were being disassembled, but we were able to ride coasters at our other seven stops. An alpine coaster written into the plan as an optional fell out of the day due to lack of time, and in truth we only managed what we did thanks to weekend traffic; anyone planning a similar mopping up exercise on a weekday should probably split the area into separate days for Europe and Asia. We walked into the Torium Mall branch of Star Park just in time to see the Shark Coaster (#2530) come to an unceremonious halt between its two helices. This wasn't a sight calculated to please five coaster counters, but it was soon obvious that this would be resolved very quickly; staff were already being summoned to get things moving again. In due course we were able to board, and from the front seat it was immediately clear what had caused the problem: the tyres on the drive motors were badly worn, with a heap of black dust visible underneath each, exponentially increasing the chance of slippage. Once we started to move the smell of burning rubber permeated the air, something I haven't noticed on other examples of the type. Our last stop was Dracula, a haunted dark ride. The entrance facade looked pretty good, with coffins, skeletons, a mannequin in striped prison garb, and two knights in full armour. The interior wasn't quite to the same standard, but it was decent enough and a pleasant way to pass a few minutes. 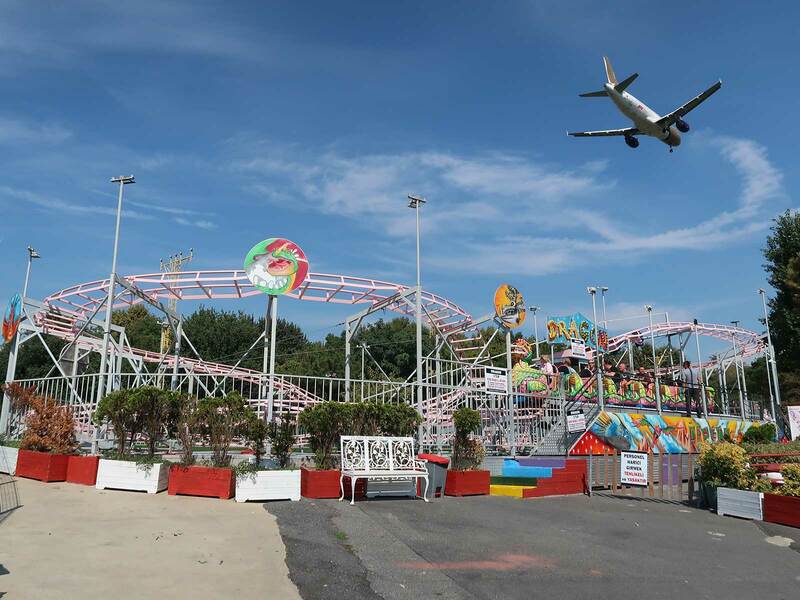 Florya Lunapark is located at the southern end of the three main runways at Istanbul Atatürk Airport, making it an essential port of call for plane spotting coaster enthusiasts in the few short months that remain before commercial traffic is relocated to the new airport in Arnavutköy at the end of 2018. The threshold of runways 35L and 35R is less than a kilometre away from the park, and aircraft using them pass roughly two hundred metres east of the various attractions. Today we were lucky enough to find runway 05 in use for landings, and we could not have asked for better, as jet after jet passed by no more than thirty metres away from the coaster. We arrived at Dragon (#2531) to find another group of club members on a similar mission to our own. An entire train filled with like-minded individuals guaranteed that our second Super Dragon in a week would be just as memorable as the first had been. The warm weather, clear blue sky, and low flying aircraft constituted icing on what was already a delicious cake. Bayrampaşa City Park is a public garden with an amusement area that occupies slightly less than an acre at its southern boundary. The ride selection changes on a very regular basis, as can be seen from enthusiast trip reports over the years; today the star attraction was Crazy Force, a rarely seen high capacity version of the Fabbri Booster with two cars on the end of each arm. The programme in use during our visit was on the far side of insane, with the arm rotating at full speed for more than two minutes in each direction; how those on board were still conscious at the end is anyone's guess. We joined a group of locals for our ride on Dragon (#2532), a virtually identical coaster to the one we'd done ninety minutes before. The only obvious difference was the colour scheme, which featured blue supports and orange track. That said, the new paint was peeling in places revealing the old underneath; if nothing changes the ride may well be back to its default pink and silver in a few years time. Feshane Dünyasi Çocuk Eğlence Parkı is located on the southern side of the Golden Horn in a very busy part of Istanbul. Those seeking to visit by car should be aware that parking in the area is an absolute nightmare, made all the worse by a one way system and some very narrow roads. We spent quite a bit of time driving round in circles before we found a paid lot at 41.0457, 28.9356; readers considering their own trip should seriously think about using public transport or a taxi. 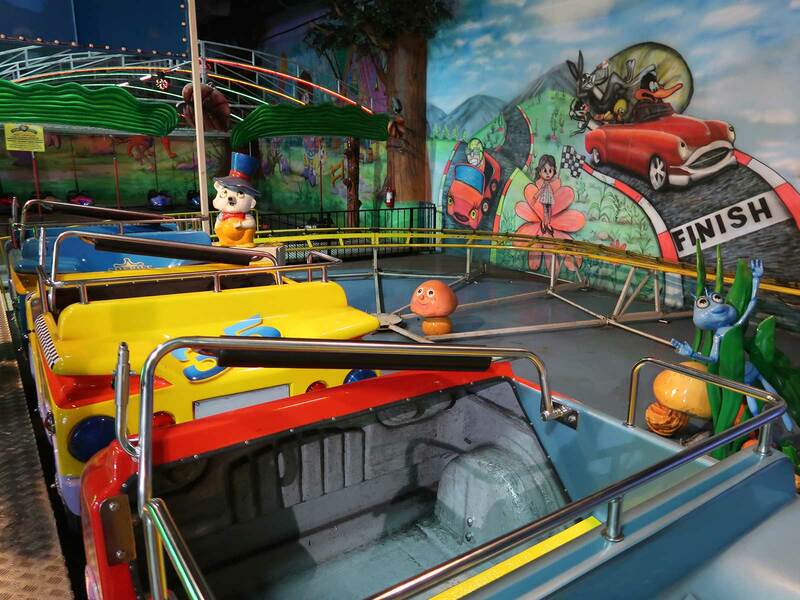 The park is geared at families, and the ride selection reflects the target audience. 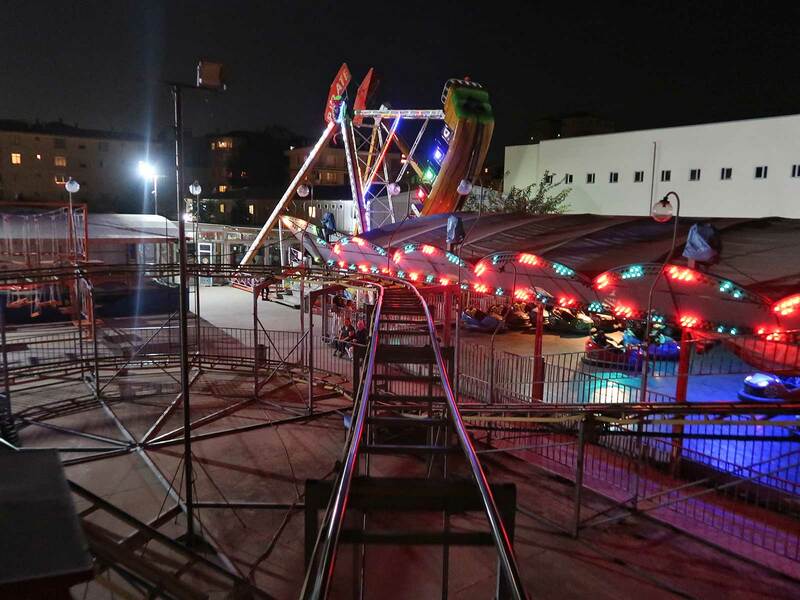 Some of the attractions look like they were installed over the last few years, including a Zamperla Midi Tower and a Rockin' Tug. Others have obviously been around for decades, and it shows. The budget for landscaping falls somewhat short of what it should be, giving the whole park an unkempt look, though in fairness to management they can likely get away with that when the majority of visitors come after nightfall. We spent a few minutes walking around before concluding that the only attraction of interest to us was Bruco (#2533), a Levent Lunapark creation that was exactly what we expected it to be. Aydos Ormanı is unique among the small parks of Istanbul in that it is targeted exclusively at young children. Some of our friends visiting earlier in the week had trouble gaining admission, and though we had no problems discretion is strongly recommended, particularly when it comes to photography. The place can be easily skipped by those who don't count coasters, as there are only two rides large enough for adults: a Pirate Ship and Brokomela (#2534), an unknown origin Wacky Worm that was likely produced by the same company as the similarly named machine in Georgia. Bruno took responsibility for buying ride tickets at Luna Lunapark A.Ş. Çekmeköy, and came away from the booth with a wide grin on his face. The explanation gave us all a laugh: the cashier had asked him whether he was part of the group that had been at Bostanci Luna Park the night before. One wonders just how many other local parks had been briefed about the group of foreign enthusiasts in their midst. Formula 1 (#2535) is a family coaster from IE Park that features a curved station, a tyre drive lift, a descending helix, and an airtime bump. The design looked vaguely familiar to me, and further research has revealed it to be a clone of a ride I experienced several years ago in Jordan. The operator's control panel was labelled exclusively in English, which wasn't what I'd have expected to see on an Italian-built ride in Turkey. Perhaps it may have once belonged to a UK-based showman. 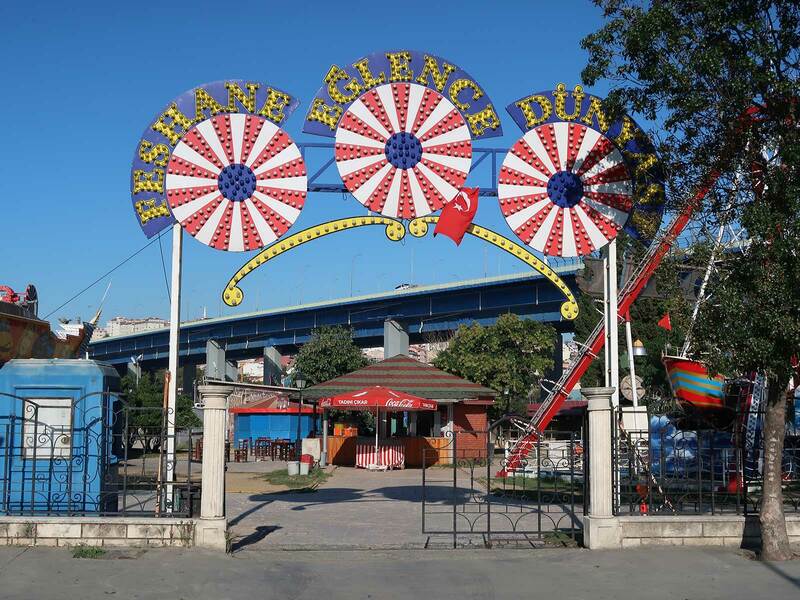 The drive to Luna Park Maltepe proved quite challenging due to a combination of fatigue, roadworks, and a misbehaving GPS. Bruno did a heroic job given the adverse circumstances, and once it became clear we were in the right general area he pulled into the first available on-street space. This gave us a pleasant five minute walk to the park. It was immediately clear that we would not need much time, as the park had just six rides; Bumper Cars, Bumper Boats, a Carousel, a Jumping Star, a Pirate Ship, and a Brokomela (#2536). Ten minutes was more than enough to tick off the last credit of our trip.